Every time you cleanse your hair you should condition your hair also. It does not always have to be deep conditioning. You can use a quick rinse out conditioner, if your hair is not chemically treated or damaged. If your hair is weak in anyway you need to deep condition your hair every time you cleanse it. THE COILY QUEENS REGIMEN CONSISTS OF CLEANSING AND CONDITIONING TWICE A WEEK. THIS CREATES A HEALTHY SCALP SO YOUR HAIR CAN REACH ITS MAXIMUM MONTHLY GROWTH POTENTIAL. If you are practicing the Coily Queens Regimen your cleansing and conditioning sessions should take no longer that 1.5 hours. Your hair should be easy to untangle, due to the oil therapy, if you have been on the regimen for at least 30 days. A deep conditioner contains some ingredients which can penetrate a few layers below the hair cuticle. These types of conditioners give your strands moisture from the inside and do not only sit on top of your hair and get rinsed down the sink. The effects of deep conditioners last longer than regular conditioners. 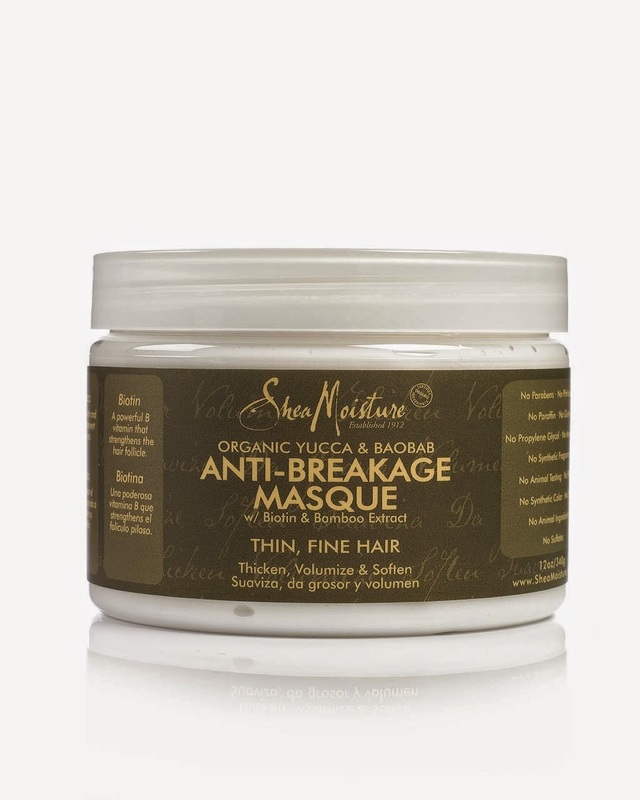 Most deep conditioners require heat to fully penetrate the hair shaft. 1. Rinse your cleanser out with medium hot water. 2. Apply a generous amount of your deep conditioner to your hair. 3. Take a cloth and saturate it with hot water, remove some of the water but not all from the cloth. 5. *Sit under a hooded dryer for 10 to 20 minutes. 6. Rinse out conditioner with warm water. 8. If applicable you do an apple cider vinegar rinse on this step, if not proceed to next step. 9. While hair is soaking wet apply leave in conditioner. 10. Once you have blotted the excess water you may need to apply more leave in conditioner. 11. Proceed with other style products and styling. 1. Instead of a clear plastic conditioning cap, purchase the silver or gold plastic self heating caps. 6. Rinse with warm water to remove product. 7. Then rinse with cold water for 1 to 2 minutes. PROCEED WITH YOUR LEAVE IN CONDITIONER AND OTHER PRODUCTS. 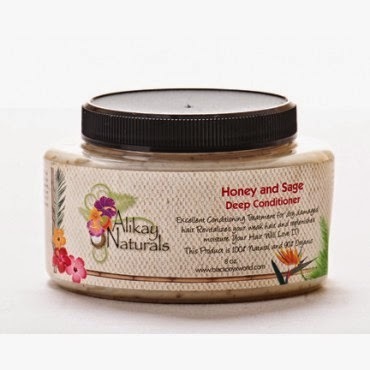 Alikay Naturals honey & sage deep conditioner, available at Target stores. Only invest in a deep conditioner as described above in the article and a leave in conditioner and it will say leave in on the bottle. 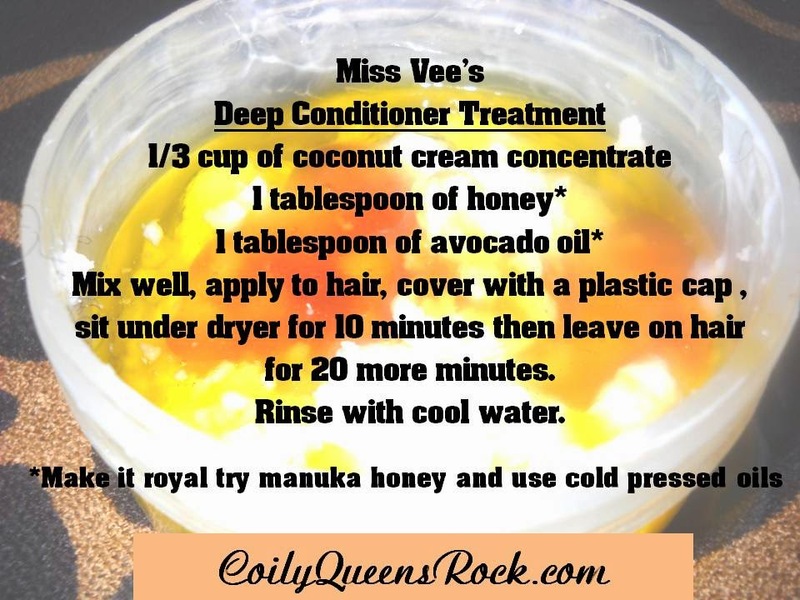 Your coconut creme conditioner is BOMB! I think it may finally be the perfect conditioner for our hair (myself and daughter) I've seen some recipes with plain yogurt? Can you explain if this helps or is an unnecessary step. I have seen fresh lemon juice added as well...same question? For sure leave the lemon juice out of this recipe. The lemon juice will lighten your hair easily. I do not work with the yogurt because I do find it unnecessary. Some people will use yogurt as a type of protein strengthener in their conditioner. However the protein in the yogurt does not stick to the hair. So you are wasting a good product on your hair. You do receive awesome benefits from eating the yogurt instead. Because you will gain the protein, the same with eggs. when you say use a cloth? what sort of material do you mean? and does the cloth stay on the head, so that you put plastic cap on top? Help I want to dye my natural hair!